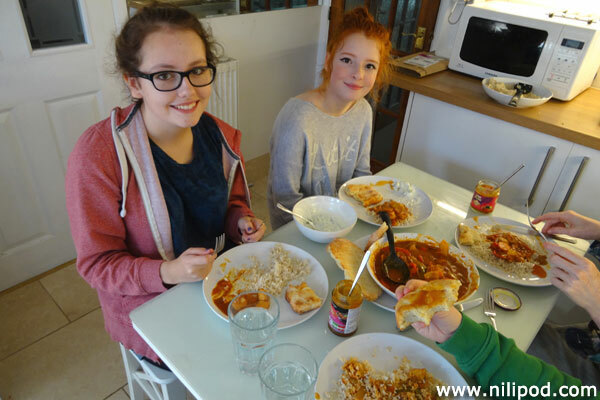 Although we're not overly keen on hot and spicy food, we love a mild, homemade korma curry, especially when it is served up with some homemade naan bread, poppadoms and plenty of mango chutney, as well as a dish of chopped cucumber mixed with yoghurt - Nia's absolute favourite. We like a chicken korma best, nothing too hot or too spicy - thank you very much. We like to eat brown rice, because it is so healthy and good for you, although white basmati rice is just that little bit nicer. If you've ever wanted to make naan bread yourself, it is incredibly easy and very quick. Drop us an email and we will share our very own recipe, which is delicious and includes plain white flour, olive oil and quite a bit of yoghurt. And the best thing is that it is super easy and quick to make, and it really makes a curry taste nicer.